Every March, we celebrate Women’s History Month by remembering the trailblazing women who broke barriers to equality in the legal profession, from Myra Bradwell, Belva Lockwood and Florence Allen to Constance Baker Motley and Sandra Day O’Connor. What is the effect of women justices on the day-to-day operations of the courts? In our research, we examined the influence of women justices, chief justices, and majority opinion authors in building consensus on state supreme courts. We found that women majority opinion writers can engender larger coalitions in majority in a number of situations, although when this is and is not the case can be quite interesting. Many scholars have sought to understand how women judges, especially on collegial courts - where justices decide cases as a group - affect the decisions of those courts. Generally, these studies have revealed little evidence of great gender differences in the decisions American judges make. Indeed, such differences are typically found only in cases involving issues relevant to women’s lived experiences, such as gender discrimination cases. Instead of looking for direct differences in decisions, researchers have considered whether women’s leadership, and gender diversity more generally, may influence the decision-making process in observable ways. This approach builds on the idea that women foster more collaborative, cooperative environments than men in the same leadership role. 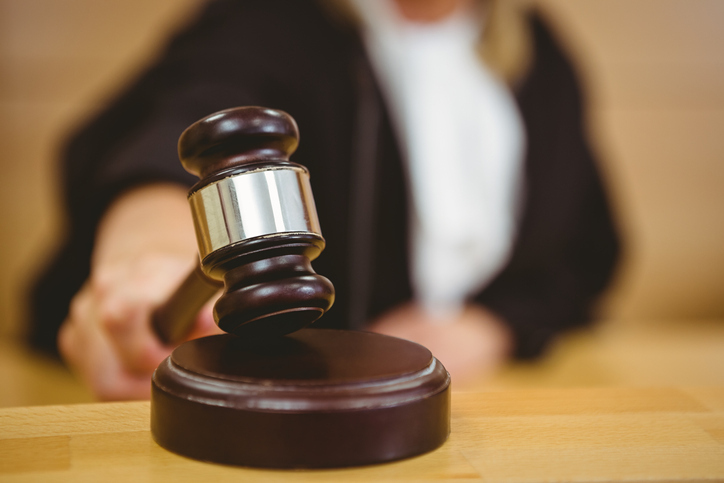 In the judicial context, these qualities have been shown to result in greater consensus or moderation when women judges are involved, both in trial and appellate courts. From this line of research, we develop a theoretical argument about the influence of gender on the opinion-writing process in state supreme courts. Considering that women judges are found to foster consensus in other parts of the decision-making process, we should see similar effects in the bargaining and negotiating that makes up the opinion-writing process. Specifically, we consider three avenues of influence: the number of women serving as justices, whether the court has a woman serving as chief justice, and whether a woman serves as the majority opinion author in a case. To test this theory, we examined the opinion-writing process on state supreme courts from 1990-2015. We collected data on all state supreme court opinions from this time period in three issue areas: employment discrimination, environmental law, and search and seizure, resulting in a dataset 6,854 written opinions. 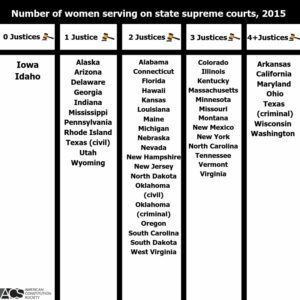 This time period allows us to capture a period of great change for state supreme courts, when the prominence of women justices and chief justices increased, as shown in the tables below. 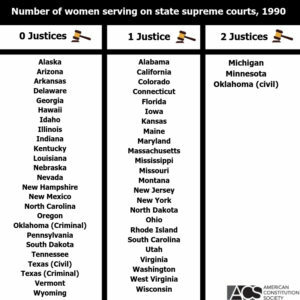 In 40 of the 50 states, a woman has served as the chief justice on the court at some point during this 16-year period. Although progress toward gender equality on state appellate courts has been considerable over the past 30 years, it remains incomplete. The Gavel Gap, a 2014 study of state court judicial diversity sponsored by the American Constitution Society found that two-thirds of state court appellate judges are men. Examining state supreme courts allows researchers to take advantage of this variance in the number of women on the court, whether there is a woman chief justice, and if there was a woman majority opinion writer. Most notably, when the majority opinion author is a woman in cases involving employment discrimination or search and seizure, the predicted size of the majority coalition increases. The effect is strongest in employment discrimination cases, where having a woman write the majority opinion increases the percentage of justices joining the coalition by about 5%. In other words, women majority opinion writers can engender larger coalitions. This is in line with our theory and what others have found about the consensus-building abilities of women judges and justices. Surprisingly, we also found that when there are more women participating in the opinion writing process, the size of the coalition decreases in employment discrimination cases. For these cases, the results show that moving from a court with no women to a court of all women would decrease the size of the coalition by 21%, or about two justices on a seven-justice court. This result was contrary to our expectations, so we explored it further. What we found was that this result only held when the majority opinion author was male. In other words, in cases where women justices are more likely to have lived experiences (like experiencing discrimination in the workplace), when men write the opinion there is more disagreement among the justices. We cannot say for certain what is happening to cause this, but it is possible that women justices may have a harder time being heard during the opinion-writing stage by their male colleagues. We did not find any significant gender effects in the likelihood that a case will be decidedly unanimously. Neither the number of women justices, nor a woman serving as chief justice or as the majority opinion author, appears to influence whether a decision will be unanimous. Of course, the importance of gender diversity in the judiciary is not limited to the perceived differences in decision-making between women and men. There is value to having a diverse judiciary, not least because institutions that are open to all and reflect the population are essential to a representative democracy. As the number of women serving in state and federal courts continues to increase, we must not limit ourselves to the simplest explanations of their influence. We began our research in search of subtler differences in leadership that may influence the way opinions are written and our results remind us that truly understanding gender and judging is anything but simple.